Any contact sport involves some chance of injury. We take many precautions to reduce the risk to our members. Safety gear is required any time members cross swords, beginning with masks and protective gloves when practicing new movements, and adding chest, neck, arm, leg, and groin protection during sparring. All sparring is observed by a senior club member to prevent risky behavior. That’s a lot of gear. Do I have to buy all of it to join the club? Absolutely not! The club has loaner gear that fits most people and is sufficient for practice and light sparring. 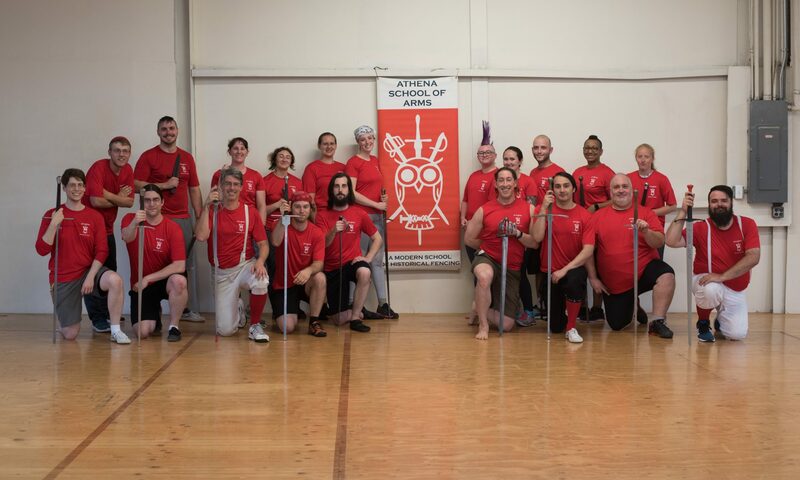 Do I have to be in good shape to start HEMA? Definitely not! We welcome a wide range of participants, from the complete beginner to experienced martial artists. As with any physical activity, participants should consult their doctor before starting to ensure they can participate safely. But those swords are heavy! Not really! The loaner swords you use in the Introductory class weigh barely 3lbs; the steel trainers weigh slightly over 3lbs. Our instructors work with participants from day one on proper structure to ensure everyone can wield the swords safely and confidently. Is the club friendly to women/men/nonbinary or gender non conforming people/lesbians/gay men/bisexuals/people of various racial backgrounds/adherents to less-common religions? Yes! Our leadership takes inclusivity very seriously and works hard to maintain an environment that is enjoyable and safe for everyone. Where can I learn more about HEMA before deciding if it’s for me? Our Resources page has pointers to a number of instructional and demonstration videos. Please don’t hesitate to contact us if you have any questions.